(You know you want one too) I have decided to brave the Truth or Dare Challenge. Dum, dum, dum, dum. Why? Because I really want to be a part of this exciting new group–particularly because of The Perfect Ten!!!! What is The Perfect Ten you ask? They are a hand-picked group of young adults who have been given an ARC of Touching the Surface for their ARC Relay!!!! You can learn more about The Perfect Ten by clicking on the link above. They look extremely cool. Yup-that’s ten amazing reasons why I should risk public humiliation. It sounds worth it to me. So hit me with your best shot–teamTEENauthor–here I come!!!! I know it doesn’t look like it from the video, but there were quite a few folks in the store as I was doing this (spring break and all) it’s just that they were FLEEING THE AREA!!! I wish I had a camera on my kids and the people rounding the corner behind them LOL! Looney Tune in Aisle seventeen!!! My own kid’s faces were a mix of bemused acceptance and horror. I could see the wheels turning as they realized that it might never be safe to bring a date home to mom. Of course my friend who took the video for me said…”Wow! I’ve missed you.” *love* I think I may have to do this more often. 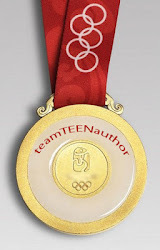 I’m going to proudly go hang up my teamTEENauthor medal now. Before you go…spill the beans. What is the worst dare you’ve ever done? What would you do to be a teamTEENauthor? What embarrassing trait actually makes you pretty proud? BTW–that was my first official YouTube video…how scary is that?? ?